Everything Astrid Mueller has tried to build is on fire, and she is nowhere to be seen, as the true monsters are revealed at last. A mind-bending climax to this acclaimed series’ first epic tale! After an act of apparent sabotage, Killian and Chloe find themselves trapped inside the memories of a vicious serial killer, where the entire world is a victim. Meanwhile, is Astrid’s seemingly innocent niece the final omen before the end of all humanity? From Gail Simone and Walter Geovani, Red Sonja: Queen Of The Plagues gives the iconic fantasy heroine a fresh new attitude! 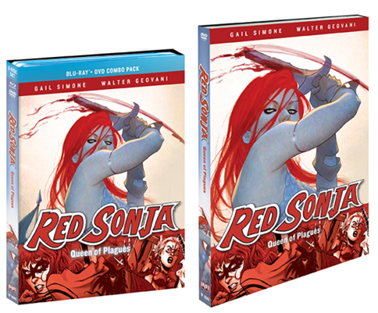 And now, you can see it all brought to life in this animated comic, starring Misty Lee when Red Sonja: Queen Of The Plagues 2-Disc Blu-ray+ DVD Combo Pack and DVD arrive on home entertainment shelves everywhere on August 2, 2016 from Shout! Factory. Red Sonja, the She-Devil with a Sword, intends to pay back a blood debt owed to the one man who has gained her respect… even if it means leading a doomed army to their certain deaths! Who is Dark Annisia, and how has this fearsome warrior accomplished what neither god nor demon has been able to do: force Sonja to her knees in surrender? An epic tale of blood, lust, and vengeance, Queen of the Plagues takes Red Sonja from the depths of her own grave to the heights of battlefield glory. The animated comic runs 74 minutes and features brand-new interviews with writer Gail Simone as well as members of the cast and crew. You can pre-order the Blu-ray and DVD now.